"We need a federal solution." R-Rep. of Tulare, Devin Nunes sitting by side of R-Rep. David Valadao of Hanford, and R-Rep. Kevin McCarthy of Bakersfield, fervently urges the need for not just state but federal solution of the drought in a recent interview. A solution, says Nunes, would allow the Central Valley water from two sources: First, it would pump water from the Sacramento-San Joaquin Delta and second, secondly, it would tap into the Friant Dam. This means putting a temporary stop to D-Senator Dianne Feinstein's San Joaquin Restoration bill. Rejection from Senator Feinstein to come to a solution to meet has caused all three Representatives from the Central Valley to push forward to create emergency legislation. 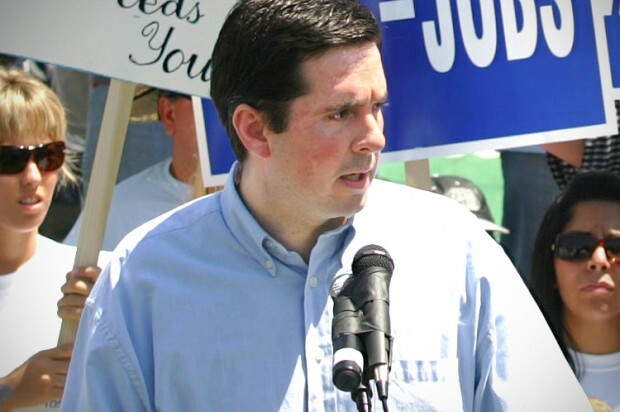 Water reserves for the last three years have not been saved, says Nunes. California has a designed a system to allow for five years, that will soon be cut short if there is no fix. Cities are now facing having no water. House Speaker John Boehner has been invited by Rep. McCarthy and is touring the Valley today to see firsthand the drought beginning in Bakersfield, then Hanford, and Fresno. According to California Dept. of Water Resources, California is in a critical state unless significant rainfall occurs within the next two months. Average statewide rainfall occurs from December to February. Last week people from both sides of the aisle protested on the steps of the Capitol of Sacramento for more water in California. However, that has not been the case in the White House or the Valley. All three Representatives are adamant about creating federal legislation in order to create better water resources for California for the short and long term. An offer to create a joint House-Senate committee would occur to draft emergency legislation for temporary and eventually permanent relief. Speaker John Boehner's visit will take place the same day as Gov. Jerry Brown's State of the State Address.